TV show dates: September 24, 2018 — present. Performers include: Melissa Roxburgh, Josh Dallas, Athena Karkanis, J.R. Ramirez, Luna Blaise, Jack Messina, and Parveen Kaur. 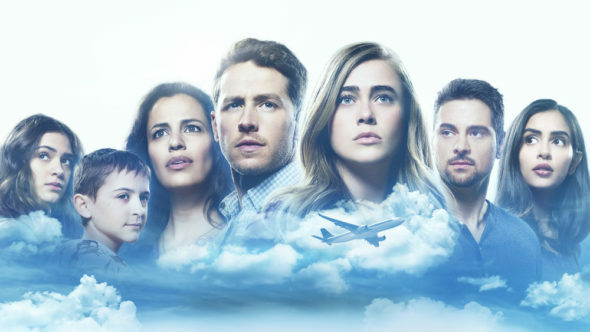 TV show description: From Robert Zemeckis, Jack Rapke, Jeff Rake and Jackie Levine, the Manifest TV show revolves around the passengers of a routine airline flight that goes missing — and then reappears. After a family vacation in Jamaica, the Stone family is returning to New York when they are separated by the airline. Adult siblings Michaela (Roxburgh) and Ben (Dallas), along with Ben’s gravely ill son Cal (Messina), are bumped to a later flight. Ben’s wife Grace (Karkanis), daughter Olive (Blaise), and parents fly ahead. The later flight, Montego Air Flight 828, hits some turbulence but ultimately lands safely. The flight crew and passengers are shocked to learn that, in the span of their flight’s few hours, five and a half years have passed for the rest of the world. Their friends, families and colleagues, believed they were all dead. So, after mourning their loss, had given up hope and moved on with their lives. Given some sort of second chance, the passengers try to reconnect with their loved ones. They also attempt to make sense of a mystifying phenomenon that seems to be steering them to act in ways they don’t understand. The passengers realize they may be meant for something greater than they ever thought possible. What do you think? Do you like the Manifest TV show? Do you think it should be cancelled or renewed for another season? More about: Manifest, Manifest: canceled or renewed?, Manifest: ratings, NBC TV shows: canceled or renewed? Manifest: Cancelled or Renewed for Season Two by NBC? Please renew Manifest. Love the plot twists and how it all builds each week giving us more of the pieces. Nice to have a weekly show that’s different. Please renew Manifest! It’s a great show! Do not leave us hanging!!!!!! I really like the show Manifest. Happy it’s returning. Please renew. Manifest is one of the best new series out there. My wife and I love Manifest. Please don’t cancel it.